KANSAS CITY, Mo. 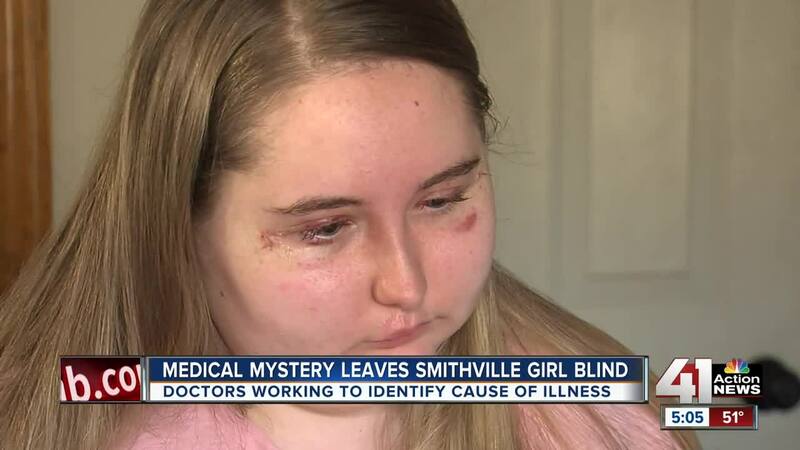 — Doctors across the country are working to figure out a medical mystery that’s left a Smithville, Missouri, teenager losing her senses, including her vision. Jordyn Walker is 15 years old and now permanently blind, part of a medical mystery she’s been battling for more than a year and a half. Walker’s symptoms first appeared in July 2017. At first, the teen experienced stomach pains associated with her colitis, an inflammatory bowel disease. Then her face began to swell and her eyes, ears and nose began to bleed. Walker lost her sense of taste and smell. “It was terrifying knowing that there is nothing I could do for her and just watching her go through this,” said her mom, Kendyll Walker. Tests results in 2017 from an out-of-state hospital came back normal so Walker’s family believed it was a one-time thing. A year later, she went to the emergency room at The University of Kansas Hospital. Her severe symptoms had returned and were much worse. “How rapid her face started swelling and how rapid the pressure in her eyes went up were quite alarming,” said Dr. Travis Langner, who is the division chief for the hospital’s pediatric critical care unit. Walker stayed in the pediatric critical care unit and underwent emergency eye surgery. The pressure on her eyes was too severe and caused her to lose her sight permanently. Walker is going to Minnesota to undergo more tests.